…..presented in the lives and deaths of those two eminent-heroick patternes, for valour, discipline, and fidelity; the generally beloved and bemoaned, Sir Charls Lucas, and Sir George Lisle, knights. Being both shot to death at Colchester, five houres after the surrender. This is the frontispiece of an anonymous sixteen page pamphlet by someone calling himself Philocrates published in 1648 shortly after the siege of Colchester was raised and the two Royalist commanders summarily executed in the aftermath. The booklet is a potted history of the siege and execution from the royalist perspective. Both officers are depicted in buffcoats (though the account details Lucas pulling open his doublet to expose his breast to the aim of the firing party), hats, boots and unconfined breeches. 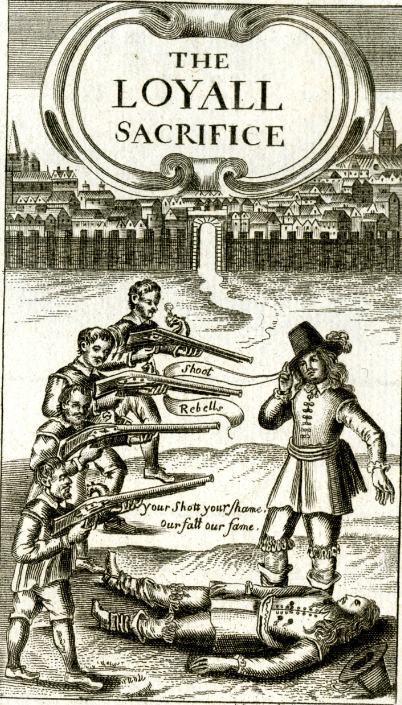 The four musketeers who look rather uncomfortable with their weapons are bareheaded with soldier’s coats, breeches and shoes. From the Bridgeman Art Library (hence the watermark). I can see no reason why this has been labelled as Royalist or cavalry, but there you are. It is undated, though to my eye, the clothes and the style of the portrait set it firmly in the Civil War period. The picture is in private hands somewhere and is © Lawrence Steigrad Fine Arts, New York. The officer is staring out of the picture quite nonchalantly and is standing defiantly foursquare in his buff coat and breeches. He looks like he’d rather be off out than stay indoors having his portrait painted. 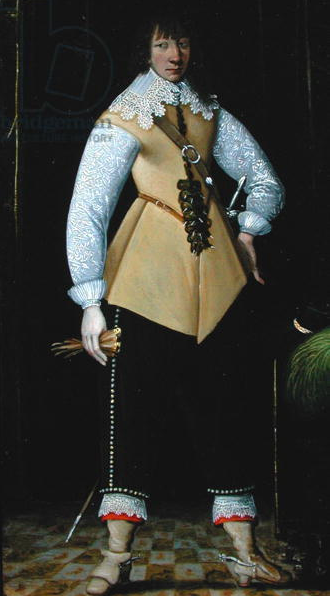 The perfectly white sleeves of his doublet contrast with the black of his breeches and are brocaded (or perhaps embroidered) in an intricate pattern whilst his buff leather coat is also extravagantly laced at the front. His falling band is edged in a wide band of lace, though his cuffs don’t actually match, being ruffled but not edged with lace. Note also the line of buttons down the side of his breeches and around the bottom edge too. His boots are lined with red leather and the boothose edged with lace, though again not the same pattern as his band, which is either sloppy dressing or indicates that as a soldier he didn’t care too much! He is wearing spurs to indicate that he is off to ride a horse, though not necessarily in a cavalry regiment. His baldric and sword seem to be quite plain and businesslike which suggests that they have seen action.